Another Birthday passed and I just turned 45. The good news is besides a few extra wrinkles, a few more aches and pains and having difficulty reading small text, I feel as good as when I was in my 20s. That can be a true testimony to the benefit of exercise! Use it to reverse the aging process! Drink a Gallon of Water? Ever wondered why you are always told to drink lots of fluids? 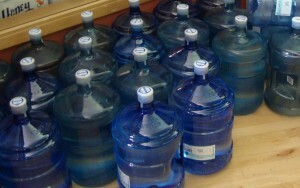 Here is a question I received asking if we should really drink a gallon of water per day! “I just read that we should drink a gallon of water per day to maximize fat loss. Was this a misprint? I picture myself on the restroom all day from drinking all that water. Please clarify. Thank you for your great articles!” M.H. There are a lot of different ways to achieve the same results. That’s why during our annual Spring Makeover Challenge, our trainers and their teams compete against each other to see who can shed the greatest amount of body fat in 6 weeks using different approaches. Last week, I shared with you Derrick DeLay’s “Interval Diet” approach to maximizing fat loss during our Spring Makeover challenge. It basically requires you consume a super healthy, low calorie diet Monday through Friday and then eat whatever you want on the weekends in combination with some cardio and weight training. If that approach doesn’t work for you, today I am sharing Jill Schiller’s approach, “Body Overhaul” to shedding that winter fat layer quickly. Jill is a mother of two, our NWPT running clinic leader, certified VIPR and Schwinn cycling instructor and American Council of Exercise Nationally Certified Personal Trainer. In the colder climates, it is common over the winter months to gain a little weight. The days are shorter, it’s cold outside and we just don’t get as much activity and access to local healthy fruits and vegetables. It’s one of the reasons that every spring we launch our annual Spring Makeover Challenge to help our clients shed that extra winter layer. Each of our trainers have teams and we all compete against each other to see who can ramp it up the most and achieve the best results. There’s nothing like a friendly competition and peer pressure to get you to do what you need to do to reach your goals. Whether or not you buy into the holiday season, we all probably experience some level of stress at this time of year. Here’s how to ensure the holidays don’t get you down. Exercise: Bet you guessed this would be at the top of my list. Exercise is the best de-stressor at any time of year and this still holds true during the holidays. But don’t get yourself worked up if you can’t keep up with your regular fitness regime. Instead, set some minimums. For example, instead of following your regular five workouts a week, over the holidays it’s OK to allow yourself to drop back to two to three workouts a week to maintain your fitness. Or, instead of your usual hour-plus routines, opt for a quick 30-minute express workout. This will keep your energy levels up and you won’t feel like you’ve got to start all over in the new year.